A “Field merge” within Oracle Eloqua are the variables associated with a particular contact record, such as an email address or first name. We can use Field merges to display information on a Landing page, or within our tracking links. (It’s just like a mail merge in Word). Using them will ensure your responses are identifiable and not anonymous. Field merge codes are unique to your Oracle Eloqua set up. Decide which contact Field merges you’d like to capture from a response. Typical examples would be email address, first name, surname, campaign name, account manager, country, city etc. Many of these codes will likely be default, however to ensure accuracy, confirmation is needed. To do this, head into your components library, select Field merge and double click the elements you’d like to capture. You’ll then find the Field merge within the Name field. In the example below, the Job title field is “Job title”. Others may be more obscure, like “First_Name1”. Once you’ve recorded all of your Field merges to be captured, move on to the next stage. Note, an alternative method to finding your Field merges is to head into your Oracle Eloqua email editor and temporarily insert Field merges into your email, using the chooser and examine their names in the HTML source on the right. It’s now time to connect the two apps together. To do this, you will need to add the Field merges to the popup. Eloqua asks for this in a specific way. They will then be recognised by Eloqua as Field merges and will populate your Contact’s details inside Customer Thermometer. 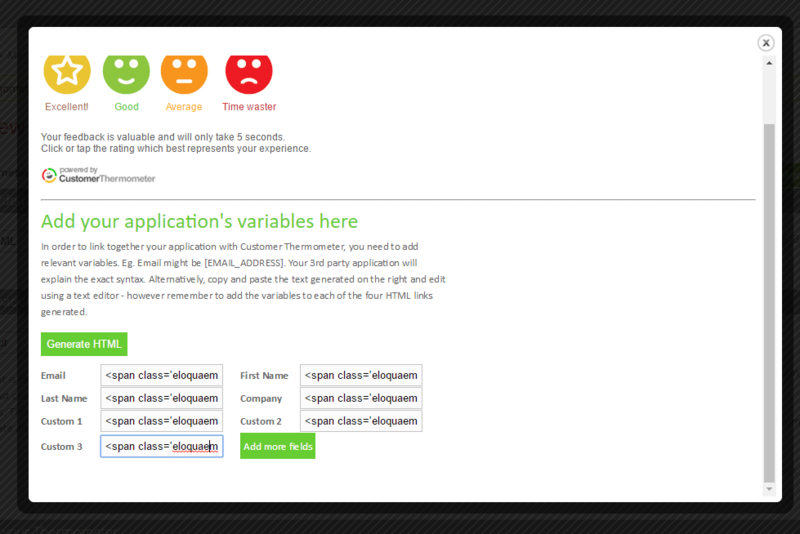 You will now see the HTML snippet generated by Customer Thermometer. The yellow highlight in the code below indicates that the Field merges are now included within the tracking links. Click and copy that code to your clipboard and then head into Oracle Eloqua. Add this snippet to the relevant part of a multi step or a simple email campaign. Oracle Eloqua, will actually change the syntax of Field merges automatically. This is correct. You can now send out your email to your contacts and all responses will contain the details pulled from each contact that you’ve set. 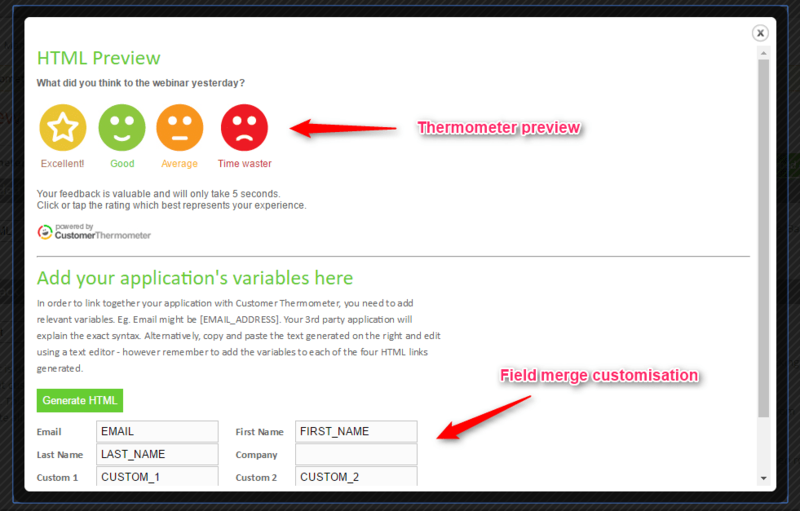 To add or edit the Field merges that you capture, head back into your Thermometer set up and generate your embed code again, using different variables. 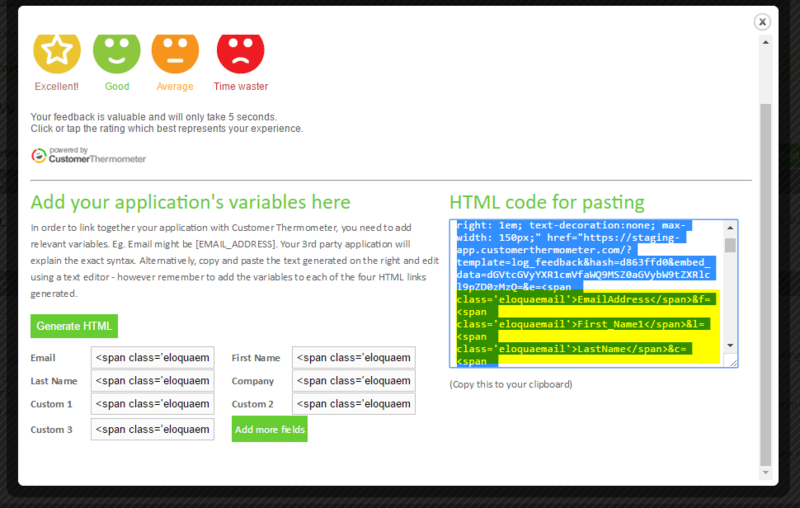 Responses will continue to be assigned to that Blast, even though you’ve regenerated the HTML snippet.